I have two requirements for all my homemade cake recipes. They have to be flavorful and they have to be moist. This lemon glazed bundt cake recipe from the cookbook Baking By Flavor by Lisa Yockelson delivers on both counts. 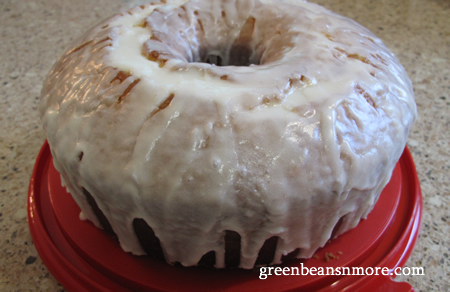 I have tried lots of bundt cake recipes over the years and this is still my personal favorite lemon dessert recipe. It's a bit more complicated than other recipes, but don't let that stop you from making it. It has four simple steps - a lemon rind soak, the batter, the soaking glaze and the glaze. 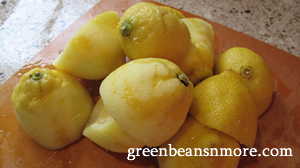 I find it's easiest to juice and zest all the lemons before you begin the recipe. This recipe requires 5 - 6 lemons. This recipe requires 5 -6 lemons. First make the lemon rind soak: Combine all of the ingredients and let stand in a bowl for at least 15 minutes. Cream the butter and shortening together on moderate speed in a mixer for 3-4 minutes. Beat in the lemon zest rubbed sugar in 3 additions, beating on medium high speed for 1 minute after each addition. Beat in the egg yolks and the lemon rind soak. Be sure to scrape down the sides of the bowl as needed. On low speed, add the sifted flour mixture in 3 additions, alternating with the buttermilk in 2 additions, beginning and ending with the flour mixture. The batter will be pretty thick. Carefully scrape all of the batter into another large bowl and then clean the mixer bowl scrupulously. Be sure to use hot, soapy water as you do not want any grease or fat left in the bowl. Dry the bowl thoroughly. Using the whip attachment, beat the egg whites until frothy. Add the cream of tartar and continue beating until soft peaks have formed. Sprinkle the superfine sugar over the soft peaks and then beat until firm peaks are formed—be sure to stop before they become stiff. Stir one quarter of the egg whites into the batter gently but enough to incorporate and lighten the batter. Then very gently fold the remaining egg whites into the batter. Be sure to not collapse the egg whites—but at the same time, the egg whites should be totally incorporated. Spoon/pour the batter into the bundt pan. Use spatula and gently even out the batter. Place in the preheated oven and bake for 55 minutes, or until the cake pulls away a bit from the sides and a toothpick inserted into the center of the cake comes out clean. Check at the 45 minute mark and place foil over the cake if it is browning too much. While the cake is baking make the Lemon Soaking Glaze: Combine the lemon juice and granulated sugar in a small non reactive sauce pan. Set over medium low heat and stir to dissolve the sugar. Remove from the heat when the sugar is dissolved and add the lemon extract. As long as the cake is still warm when you spoon this glaze over it, the temperature of the glaze itself will not matter. Remove cake from the oven and allow it to cool, in the pan, on a cooling rack for 10 minutes. Then invert the cake onto the cooling rack placed over foil or wax paper. Spoon the Lemon Soaking Glaze over the cake, taking care to moisten both the sides and the top. Let cool for 15 minutes. While it is cooling, make the Lemon GlazeTopping: Place the lemon juice, powdered sugar and melted butter into either a bowl. Using a hand whisk mix until incorporated. After the 15 minutes are up and the cake is no longer moist from the glaze, pour the Lemon Pouring Topping over the top of the cake, letting it cascade down the sides. Cooks Tips: I don't know how much icing you like on your cake, but this recipe for lemon glaze makes twice the amount I need. I made this cake for a friend's birthday. She loves sugar, so as you can see from the picture below the cake was VERY WELL covered. I still had a lot left over. I'd suggest cutting the lemon glaze topping recipe in half.